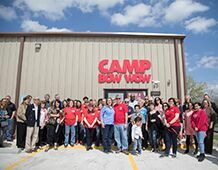 Camp Bow Wow®, the largest and leading doggy day care and boarding franchise, announced the opening of its 150th Camp in Hutto, Texas. The 7,500 square foot Camp houses a brand new, state-of-the-art custom facility and 1,500 square feet of outdoor play space for the dogs. This milestone Camp opening keeps the brand on track for significant growth at the unit level, planning to open a total of 20 locations in 2018. In addition to the company's newly announced milestone Camp opening, Camp Bow Wow's low-risk, high-growth business and franchise network has also recently been recognized by franchise authority Dr. John Hayes in his latest book "12 Amazing Franchise Opportunities – Second Edition." Dr. Hayes explores the people, histories and associated successes of 12 franchises he considers "amazing" business opportunities, which includes Camp Bow Wow. Being part of this book is a true testament to the brand's leading position in the franchise sphere. With Camps in 40 states and Canada, Camp Bow Wow is as a major player of the estimated $69 billion pet care industry according to the American Pet Product Association. As the company continues to align itself with strategic franchisee partners who are interested in investing in the pet care business, the brand is on track to reach its long term goal of more than 300 units in the next four years.